Briefly, it’s a weekly hour-long radio program devoted to music written for motion pictures. I began doing it back in the late 70’s at the old WQRS when we had scheduled a syndicated movie music show hosted by the composer David Raksin (“Laura” among other scores) which management decided not to run when it turned out the program was not free. Jerry Dellinger, our Music Director at the time, remembered that I was a fan of cinematic music, and asked me if I had enough material in my collection to do a month’s worth of programs so our Program Guide would be more or less accurate. I said “I think so,” and wound up doing the show for about 18 years until 1997. 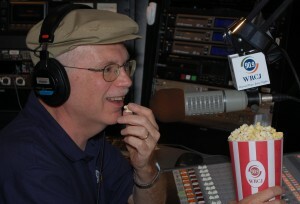 Later, when WRCJ came into being, Dave Wagner asked me to come on board and mentioned that if things worked out, we might be able to bring the show back here on 90.9 FM- and sure enough, that’s what happened in April of 2007. It is truly a dream come true to be able to do the program again- to be honest, I doubted that I would ever get another opportunity. The music we play on the show consists mostly of orchestral scores from the early 30’s (the beginning of talking pictures and of background scoring) up to the present (as recently as last week’s new releases), and as I like to point out to people, Film Classics is the only program on WRCJ exclusively devoted to music from the 20th and 21st centuries literally, there’s new material coming out all the time, as well as new recordings of classic scores by the old masters of the genre like Steiner, Korngold, and Herrmann. Sometimes the show will be devoted to a single score, like “The Ghost and Mrs. Muir”, or sometimes it will follow a theme, like “Submarine Movies.” Generally speaking, we don’t do pop soundtrack compilations or very many musicals. The theme music for the show, heard at the beginning and end of each program, is the main title sequence from “Since You Went Away” by Max Steiner, which won Steiner his third Academy Award for Best Original Score in 1944. Hey Jack, have you ever done a program dedicated to the music of Pino Donaggio? I would really love to hear a selection of his scores. Hello Joan, yes actually Jack did do a Pino Donaggio show although that was maybe ten years ago now. Maybe it’s time to do another. Thanks listeners! We will send this along to Jack. He appreciates your loyalty! Love all the Christmas music today. Please let me know the name of the song being played at 6:40 on Jack Goggin’s show. It’s haunting me. Thanks in advance. I always enjoy your show. Sometime I hope you have an entire program of music composed by the great Ennio Morricone. He has written for many great films. I especially like the love theme from “Bugsy” and most of the music from “The Mission”. Exceptional composer. Thank you Thomas. Jack did an Ennio Morricone show some time ago but he could easily do another one. We’ll see. Selections from “The Mission” always get a good response when we play them. I heard the most beautiful piece at 6:55 pm tonight, heard that the composer (I think) was someone by the name of Doyle, yet when I tried looking up the name on your playlist, it said George Gershwin. I’m disappointed I won’t even know the name of that melody. Patrick Doyle’s Thor music was earlier in the show but Jack mentioned him at the end. Thanks for listening! I’d love it if Jack played the great “Footloose” soundtrack. It rocks!!! For the last time Mr. Bacon, please, stop requesting that one. Hello Jack, I tuned in about 6:15 yesterday and heard a few songs and imagined myself sitting in front of an old tube radio. What were they? Hello, at that time Jack was playing music from Carol Reed’s noir classic “The Third Man” composed and performed on the zither by Anton Karas. The zither has an interesting sound. I listened to the show on Sunday 7/15. Whst was playing. I was in the car at about 6:10 but couldn’t stay yo gind out. Hello Dave, at the beginning of the show Jack played James Horner’s music from Aliens (1986). The second half of the show was The Rocketeer (1991). I was not able to hear the full broadcast on Sunday evening 6/17/18. Would you please let me know which Korngold film score it was that you played? It was lovely. Hello Anne, sorry you missed it. Jack Goggin played the score from “Anthony Adverse”. With America’s past time starting to heat up, are we going to hear from movies like “Field of Dream” “League of their own” “Pride of the Yankees” etc,etc etc………. Hello Dan, that’s a possibility. Our Film Classics host Jack Goggin might be interested in doing such a show as well. Thanks for another fine show. I have fond memories of picking this CD up from the record store I worked at when it was released. Like a lot of music buffs I can vividly remember when and where I first heard so many albums. WRCJ and WQRS are a part of many of those memories. Thanks Byron, we will pass your note along to Jack. Sadly, it’s much harder to find a music store these days. A belated thank you for playing Korngold’s wonderful score of “The Prince and the Pauper” this past Sunday. Having just heard his Violin Concerto at the DSO, I found it especially interesting to see how heavily Korngold borrowed from that film score for the violin work. I do so enjoy your show, and try to listen when I can. Hi Terese, we’re glad you enjoy the show and Jack thanks you!